It's time to post the tutorial for a DIY alternator replacement. What the dealer may not tell you is that the F136 alternator is essentially a standard alternator with parts that are typically in stock with any rebuilder, including the pulleys and bearings. I had mine rebuilt with a warranty for $189 and I installed it myself, saving THOUSANDS. It was a fairly easy job. Here's a step-by-step of how I did it. It took about 4 hours total. 1. Medium and large socket set. Metric only, of course. 1. Disconnect the battery. Make sure you have your radio code handy or else call the dealer in advance to get it. 2. 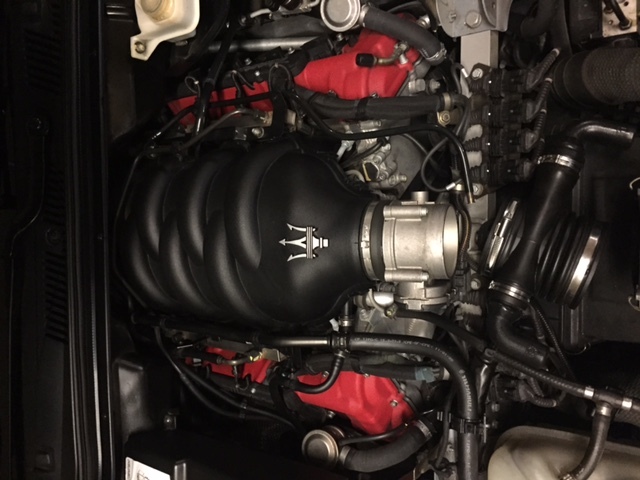 Vacuum the engine around the intake manifold, above the cylinder heads, especially around where the intake manifold tubes connect to the top of the motor. This is especially important due to debris that could fall into the motor once the manifold is off. You could use a blower but I recommend a vacuum with a hose attachment. 3. Remove all the cosmetic cowlings that surround the motor. This is done using a small Torx tool and a philips head screwdriver. Take photos of the screws you are removing and/or place them in marked bags. You will have lots of them as you progress. 4. 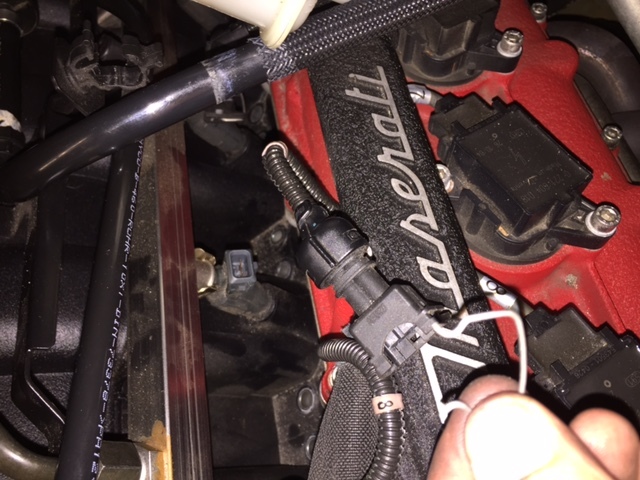 Unplug the MAF sensor and the sensor that connects to the front of the intake just ahead of the manifold. The MAF is easy, but the other one will take some patience. You must push the small side clips and pull. 5. Remove the MAF tube. This involves loosening the fore and aft clamps and wiggling it out. It makes it easier if you unclamp the top of the airbox when doing this, just make sure you reclamp it when you are done. 6. Begin disassembly of the firewall forward components. This means the entire plastic shroud that conceals the wiper motor must be removed. To do this the wipers must be removed. 7. To remove the wipers, just remove the caps and unscrew the nuts beneath them. The drivers side has a guide that attaches with a small hex bolt at the base. Do not lift the cover at the pivot point of the guide and try to unscrew it there - just unscrew the hex bolt at the base. Slowly work the wipers off by pulling straight up. Slowly rocking the wiper (not jiggling it) will help it release. 8. Once the wipers are removed, the plastic cover at the base of the windshield comes off after a series of philips head screws are removed. Once it is free, remove it by lifting it and bringing it away on the windshield side of the hood, otherwise the corners will not fit through the engine bay and they will break. 9. Now the windshield wiper motor and gear assembly must be removed. There are 3 points where it needs to be removed via nuts/bolts. In at least 2 of these points, there are shims that look like washers. Remember the position of the shims. I think mine were 4 shims beneath the assembly and one on top for each of the bolts. Mine might be different from yours so just take note. Once this is free, just slide it out through the engine bay. 10. Now the plastic tray / drain (the tray that extends the entire width of the engine bay and housed the wiper motor and gear assembly) needs to come out. Start with removing the screws from the large plastic box on the left side of the engine. The box needs to be loosened in order to give the room for the tray/drain pan to be removed. Next, remove all the screws and nuts the hold the tray in place. There should be a series of philips screws and two nuts on the back side of the engine bay. 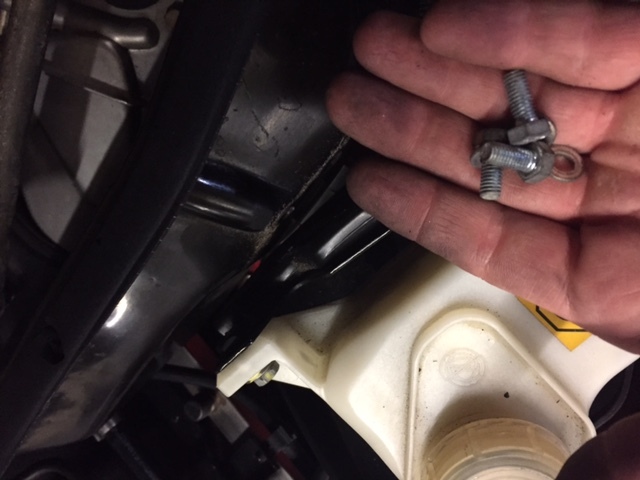 You must also disconnect the brake fluid reservoir from the tray also by removing the 3 bolts from the inside of the tray at the reservoir. 11. Once the tray/drain pan is free, slowly lift up and forward, keeping an eye on the stiff rubber tubes that hang below. It will be tricky because it is a tight fit - just take your time. Also now that the brake fluid reservoir is disconnected, keep a close eye on that as well. Try to keep it propped up and upright to prevent seepage through the cap, which WILL happen if you're not careful. 12. Once all the trim is removed, you should have much better access to the rear of the engine and both banks. 13. Now you will start on the engine. Begin with removing the black metal guides that hold the small hoses and wires in place on the top of the engine. They are on both sides. 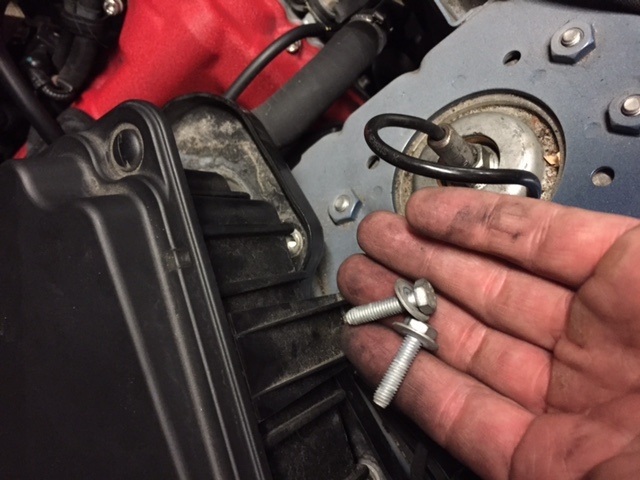 These guides will get in the way when trying to access the intake manifold bolts. There are two nuts per side that are plainly visible on the top - remove them, carefully unclip the hoses from the guides and slide them out. 14. Now remove the sensors that attach to the top of each cylinder head at the intake manifold. These sensors have a small retaining clip that slides down, not up. So, using a flat-head screwdriver, keep one finger on the bottom of the clip and pry it off gently. These clips are lightweight and easily lost so be careful. 15. With the guides and sensors removed, you should have easy access to the 16 hex bolts that fasten the intake manifold to the block. All of these need to be removed. One at a time, remove each of these bolts. Take not of the general torque setting by loosening and retightening, if you don't have a torque wrench. You may want to get the torque setting from the dealer if you do. They are typically helpful with this (at least the FM dealer in Orlando is). 16. 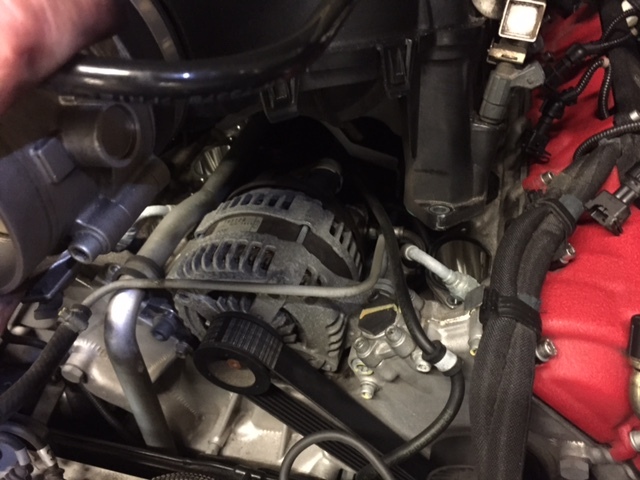 Once the intake manifold bolts are removed, gently lift the intake manifold from the throttle body side (the front) and move it up and slightly forward. You will be able to rest the manifold on the hard metal fuel injection lines that go to the front cylinders. This should give you access to the alternator. At times you may need someone to lift the manifold higher for easier access, however keep motion to a minimum. I tore my back manifold gasket (cylinder #4 ) due to movement I suspect so be careful. 17. Now, locate the belt tensioner directly beneath the alternator and to the right. Using a large ratchet (sorry I do not remember the size), turn the tensioner counter clockwise to release the tension. This should be easy. Do not let it spring back without tention--I used the small part of the cross beam / sway bar to hold the ratchet in place during the entire job, keeping the tension constant, which made reinstallation a breeze. 18. Time to remove the alternator. There are 2 bolds (one short, one long) holding in the alternator. Remove both the bolts, taking note of which goes where. Once the bolts are removed, the alternator will not just lift out. It will likely get stuck between the mount on the right and an aluminum tube on the left. This aluminum tube which runs from the bottom, front of the engine to the top and underneath the intake manifold, has a stabilizing mount screwed into the front of the block. Unscrew that mount, giving the tube slightly more movement and then try to work the alternator our. Lifting up from the left worked for me. Reinstallation will involve seating the alternator from the right side (looking at the engine) first then working the left side in. 1. When reinstalling the wipers, test them out with the HOOD UP! Otherwise they will likely be misaligned and will snap back too low and strike the hood. Once the alignment is done, close the hood. 2. The manifold gaskets are at risk with the movement of the manifold. Keep a close eye on the car after its first test drive and listen for any leaks. Mine developed a leak after hard driving 20 minutes after the job. I likely damaged the #4 gasket due to the weight of the manifold resting on it at an angle for an extended period of time. Also, for some reason, the #4 gasket seems to be the one to fail, if a manifold gasket ever fails. Maybe this is why. If I remember any additional points, I will add them with more posts. If you have any questions or need any help, feel free to call me at 646-789-1535. Great write up Erik and thank you! I just had my alternator replaced one month ago and would have love to complete this on my own, but this will no doubt help many people on this forum. Excellent! I'm out of town for a week and then this is happening on my 06. Nice write up! I love the little details and cautions, just like I do mine. Those are the things that are invaluable when doing a job for the first time, the first hand insights and tips from actually doing the job. Seems like a good time to do the spark plugs as well with all the shrouds apart. ..... and, if one is really keen, change the O-rings and clean the fuel injectors by dipping them in solvent. Thank you Erik for the detailed write up. You mentioned that there are 2 bolts holding the alternator. Looking at the last photograph of your post, I imagine one of the bolts is just to the left of the pulley. Is this correct? and where is the second one? I dont think you can see either bolt. They are almost always 180deg apart from each other for obvious reasons. One looks to be just behind the black box with the yellow stripe on the right side, the other is probably obscured by the black air hose on the left side. Yes, there is one bolt on the left and one on the right. Once opened up, you'll see them. After you gain access to the alternator, it becomes self explanatory. Just remember the trick of lifting it out. Installation will be much easier. Nice post! Do you have any information on the parts used to repair the alternator? Mine is on the way out and the dealer is saying that nothing can be sourced locally (Australia) to recondition it. Just finished swapping the alternator - had trouble getting it out because of the metal pipe, of course. Eventually though, I figured out how to move it out of the way enough to get it out. Second person helping would be great, I used a tie down to pull it to the side. It seems sturdy enough to take the pressure. The ratchet to move the belt tensioner is 16mm - if you use one with a long enough handle, you can jam another tool in there against something to hold in in place for the whole swap until you are done. Thanks so much for the write up! I just got done using your instructions to replace my alternator (2007 QP Exec GT Auto). This was by far the biggest job I've done with a car. While I had the car opened up, I changed out the belts and cleaned the throttle body. I figure I saved at least $1200 in labor, bought the alternator on the internet for $600. thank you for posting. 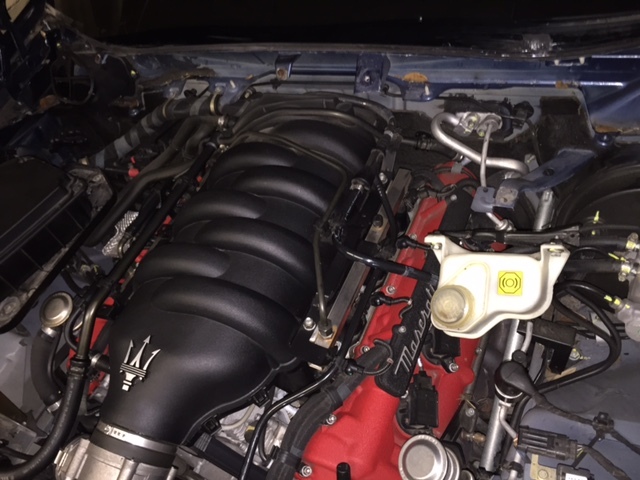 regarding intake manifold gaskets, would you recommend new ones? if so, are there eight?